Exhale Fans, how do they work? Thanks to its high efficiency motor and its competitive design, the high speed air displacement reaches 2.97 cubic meter per minute (i.e. 2973 litres per minute). But over and above the technical characteristics, the real difference remains in the Vortex effect created. 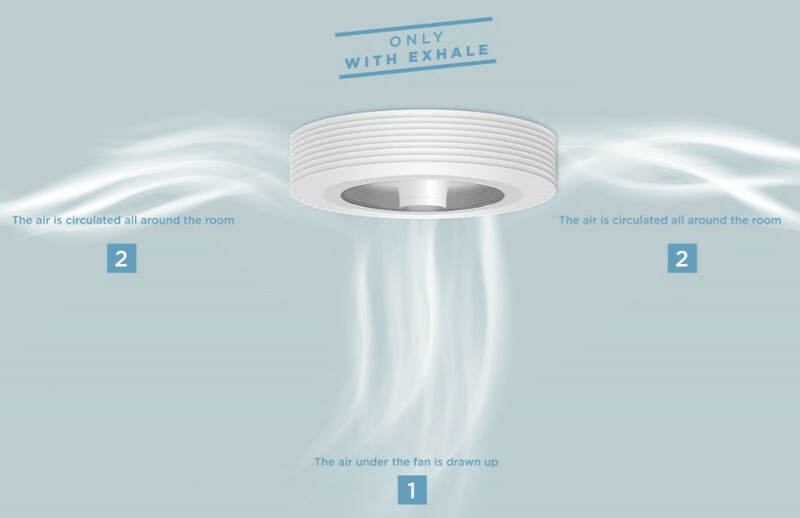 During use, the airflow is increased resulting in major effect such as stabilised room temperature. The air under the fan is first drawn up; then the air is redistributed and circulated all around the room. The Exhale ceiling fan is a air conveyor which allows the room where it is installed to be entirely ventilated. Here are a few videos showing how it works. Like on a beautiful spring day, you feel a gentle and refreshing breeze surrounding you. An ultra efficient ceiling fan! All ceiling fans must have a solid and reliable structure. The Exhale fan spins at over 300 rpm, i.e. considerably more than traditional fans. With these high speeds, a reliable and efficient circular system is needed. Our system is also simple to instal! We have developed an exclusive DC motor to maintain a maximum rotation speed (more than 300rpm) with an optimal efficiency. DC motors are ecological compared to their equivalent AC models. They use between 50 and 80% less electricity! The motor of the Exhale fan was developed by an engineer that worked in the space industry. The inspiration came from the bladeless turbin from Nikola Tesla. It reproduces the function of an aeroplane jet engine. Its technicality guarantees a free air flow through our ceiling fan. The air molecules are ejected out by centrifugal force. When one is ejected, another takes its place on entering by the centre, this is the Vortex effect. While ejecting the air at 360 degrees, the Exhale fan gradually transforms a foul environment into a place of perfect comfort in all seasons! We wished to preserve the refined style by a careful design such that no screw nor bolt should be seen from any angle, resulting in a fan with unique design and efficiency.